Posted October 24, 2013 by Joel Goldman & filed under Crime Novels. Earlier this year, I interviewed Public Defender Alex Stone in hopes that she could share her thoughts about the increasingly dark and dangerous crime scene in Kansas City. I got to know Alex and her life partner, Bonnie Long, MD, while writing Stone Cold, the first book in the Alex Stone Thriller Series. I asked Dr. Long for an interview, on the record, of course, so my readers could find out what it’s like to love and live with someone as intense and driven as Alex Stone. I arrive at Truman Medical Center, where Bonnie works as an ER physician, at noon. Bonnie stood waiting for me at the entrance to the All Spice Café, a quaint bistro-style eatery located on the hospital’s ground floor. In sharp contrast to Alex’s short, black hair and lean, athletic build, Bonnie has long blonde hair, sparkling blue eyes, and a figure that rivals actress Scarlett Johansson’s. I never knew anyone could look so good in shapeless blue ER scrubs, but I digress. Bonnie ordered a turkey breast and provolone sandwich with an iced tea and I got my usual Reuben and ice water. We sat down near the huge plate glass window and I dove right in to my questions. JG: Bonnie, thanks for having lunch with me. I’m sure there’s never a slow day in any urban ER, but especially this one, given its location. BL: You’re right; it’s always intense around here. When it seems like things will slow down for a bit, another patient comes rolling in — stab wound, gun shot, broken bones, car accidents, accidental poisoning, you name it. But, I’ll always have time to spare for you, Joel. So, what do you want to know? JG: How did you and Alex meet? BL: I was umpiring a women’s softball game. Alex rounded third, barreled toward home and crashed into the catcher and knocked herself silly. When I umpire, I do double duty as the doctor on call because, let me tell you, these women don’t mind throwing a few elbows. Anyway, I kneel down next to Alex, she opens her eyes and looks into mine and, well, what can I tell you. It was love at first concussion. JG: What’s the best thing about living with someone like Alex? But I still think Alex has a much more difficult grind. I mean, for me, there’s only a short window of time to get my patients past that point of no return. Once it’s over, it’s over. Her cases drag on and on and the intensity never lets up. I admire her for her commitment to getting justice for the people who can’t afford the big bucks defense lawyers. Alex could have chosen another area of law and made half a million a year or more. But she chose this. That’s why I love her. She gives the gift of herself to her clients. JG: What about marriage and children? Any plans for that on the horizon? BL: We’ve talked about it, on occasion. Marriage, I mean. We’ve talked about going to Vermont to see the fall color, so you never know. As for kids, well, that’s a tricky one. Let me just say that everyone should read Alex’s next thriller, Chasing the Dead. JG: Do you ever worry about your or Alex’s safety after what happened with Dwayne Reed? JG: Have you two recovered from all of the craziness that arose out of the Dwayne Reed case? BL: We thought we came through that okay, but when Alex took on a new client in Chasing the Dead, we found out that some things are never over. JG: I love that title. What can you tell my readers about her new case? JG: Thank you again, Bonnie, for agreeing to chat with me about Alex and for giving me a peek into your life together. I’ll be thinking of you both as she continues Chasing the Dead. 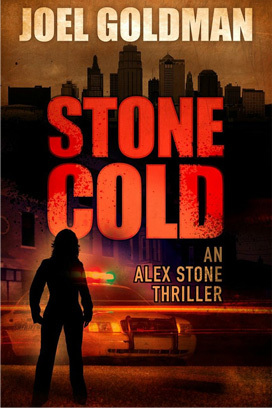 Grab your copy of Stone Cold so you can get in on my newest series from the beginning. The second book in the Alex Stone series, Chasing the Dead, is coming soon. You won’t want to miss it!